Events-Calendar — Quincy Valley Chamber of Commerce Quincy Valley Chamber of Commerce - Servicing and promoting businesses in Washington State. Weigh-in starts at 10:00am must be in line by 12:00am. Must be present for awards and drawings which will start directly after weigh–in closes. Crescent Bar boat basin, fish anywhere along the Columbia River from Rock Island Dam to Wanapum Dam. 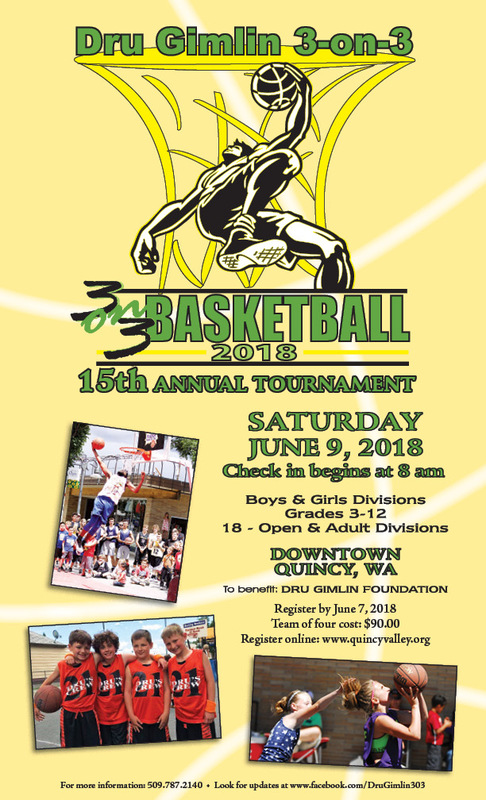 TICKETS ON SALE NOW: Quincy Hardware & Lumber, Quincy Port District, Wheatland Bank, Washington Tractor, Quincy Valley Post Register, Chamber Office & Online at www.quincyvalley.org and QHS clubs & sports groups. Call 509-787-2140 for more information. A Harlem-style comedy basketball show featuring high-flying slam dunks, games with the kids, and hilarious comedy! Meet the Harlem Ambassadors after the show.